In an office it is commonly seen that all the employers or the boss are normally acting as a well wisher of their employees but it is not true all the time. There may be certain dumb lies which a boss tries to deliver in front of the employee to protect themselves. A boss is a person who tries to keep both employer and the employee comfortable with each other, and sometimes an employer is the boss of the company. 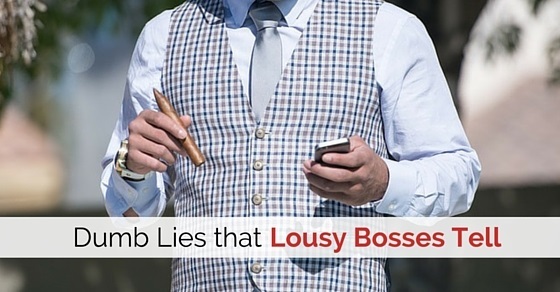 For every single lousy lies that a boss delivers, there are certain hidden reason behind them. Sometimes it is possible that an employee expects a raise in his / her salary for the work he/she had provided for so long time. But it’s not what a boss thinks about his / her service. When an employee tries to explain an employer or the boss about his / her point of view regarding the rise in the salary, at that point of time a boss tries to explain an employee the perfect lousy lie which is that, he/she is receiving a competitive salary to boost his / her career. But the truth is that an employer or a boss can only afford to pay an employee that much of a salary. It even happens that whenever an employee expresses his / her difference of opinion with an employer or with the boss, the result of such argument will state in a statement as, the boss is trying to improve your career or working for your successful career. It is very normal to receive such kind of standard behavior from all the bosses over certain difference of opinion. Therefore, it has been a habit to receive such lousy lies from an employer or from the boss. This is one kind of lie that an employee is receiving it since he/she has started their career. This kind of statement is made to realize all the employees that whatever may be the problems should face together like one happy family. A boss is a person who can manipulate all the employees thinking according to his / her thinking and this kind of lousy lies are the examples of his / her controlling opinion. Now, this kind of statements in an office seems very funny and laughable. It is possible that a person joined an office receiving such statement that the company is working on the five year plan, but still after some more years of working in that company still that particular employee is receiving that same statements and it will go on until an employee understand the meaning behind that statement which is that the company is trying to adapt such plans from years and it will be fulfilled one day. For example, an employee may be possibly heard something that his / her brother-in-law can handle that position better. Family inclusion is the traditional trick of every single employer or the boss. If there are any suitable promotions needed to be executed, then at that point of time an employer suggests of appointing a person from his / her family. By these kinds of lousy lies around a boss an employee need to survive his / her official duties. While joining a company any fresh employee feels excited to join in thinking that it is 9 to 5 jobs. But the actual truth is that an employer is trying to convey that this a minimum 9 to 5 jobs and a maximum of working hours will be depending on employee availability. This kind of statement has been very clichéd to hear it. All the employees expect a certain level of freedom from his / her job at some particular point of time, but it is never ever possible that a job can leave an employee alone. Sometimes it happens that because of some uncertain events of company situations, there is a possibility that a company can go through some type of hard time. At that point of time, all the employees of the company are expected to believe the statement which declares that to never believe any kind of extra rumours about the company. But it is not true all the time instead, there may be a possibility of such rumours in facts. Only some companies believe in such statements that all the employees of the company are to be treated as a valuable asset. But in some company, those employees who can be treated an asset of the company are very likely to be treated as a liability of the company. It is possible that an employee is a person who makes an office complete and fulfils all the given duties as per an assignment. So an employee is surely a valuable asset. Because of these kinds of a statement or lousy lies, an employee feels very uncomfortable working in that company. A company expects voluntary participation in one project or in one assignment, but the truth is that an employer or the boss expects the full cooperation of all the employees of the company. It is unethical to expect his / her employee participation in an assignment or event, but it is not right to force all of them to participate compulsorily. These kinds of awkward statements are only seen in such situation when an employer or a boss tries to build some personal relationship with their subordinates. And honestly, that above-mentioned statement is a complete lie because a married man who is being in such great position will never risk his / her position just for the sake of love. But it is believable that the boss is trying to get the advantage of certain situations and of certain people as well. It is very true that an employee can lie to an employer or to the boss only if he/she is a lousy boss. A lousy boss behaves like, he really cares about his employees, but the truth is that they never care about them for not even a second. It is also possible that an employer never understands the needs and wants of their own employees, which can be turned as a negative element for the company. An employee of the company should be treated as an asset of the company, but in the company in which lousy boss have control, there all the employees are treated as a liability and because of that kind of behaviour all the employees of the company become even lousier than their boss. It reflects in their work eventually and even having a talent with skill, no company want to poach them to their company. An employer or the boss who makes all the employees work according to the prescribed deadline can create an unhealthy environment inside a company or in an office. These kinds of deadline can make all the employees lose their health and inner peace because of constant work without any rest. Providing deadline for some kind of work is a professional option but accepting those deadlines to be fulfilled without any issues, can create problems between the officials of the company. It is even possible that all the employees of the company are afraid of their employer or the boss because of his / her official power. Threatening all the employees of the company to follow his / her orders and making them feel as they are his / her slaves. These kinds of behaviours of an employer or the boss is considered as a legal offence. A boss can never force an employee to work for him/her against his / her will or wish. A boss or an employer can be considered very lousy if he/she tries to steal his / her employee’s credits. This is unfair to all the employees of the company when an employer is trying to steal their hard-earned name. To prevent that, the employees can file a complaint against such a boss or the employer charging credit stealing. It is always better for a boss to provide his / her employees all the benefits which they deserve. A company offers overtime for those employees who work more than a specified period of time and also provide them with extra money for the work they provided for extra hours. But in some of the company, it seems as the boss is forcing his / her employees to work in that company as per his / her orders and also make them work there extra hours without any extra pay which is considered as a legal offence. A lousy boss can even mislead his / her employees for the sake of his / her successful career and they even blackmail or force them to work for them without their will. These kinds of behaviours of a lousy boss should be taken under the category of harassment, which creates a mental impact on all the employees of the company. And to overcome such mental condition, an employee needs to take strict actions against such lousy boss. So that there will be a lesson learnt or sent to all such lousy bosses. To end this discussion, we would suggest that all the employees need to understand their duties, rules and regulations which has been created only for the welfare of the employees and their employment system. And it is necessary to understand all the given rules just to be safe in this corporate world. Because it may be possible that an employer or a boss may take advantage of an employees humble and honest efforts. Such bosses who take advantage of their employees are called as a lousy boss and they try to trick their employees with some of the lies over the years. Therefore, to understand such lousy lies of a boss or to rectify such lousy bosses, a person who is working in such offices need to follow all the above mentioned steps to find out whether their boss comes in the category of a lousy boss and if they do come, then be able to handle such lousy boss.